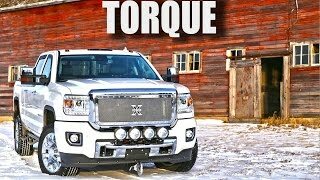 Air Suspension Ball Mounts: The Air shocker has a capacity of 12,000 lbs of towing. Fits into standard 2" receiver hitch tube. The air bag sits under receiver tube. Adjust the air pressure for the best ride and load control. Easy to attached and adjust. 5lbs of air pressure per 100 lbs on tongue weight. Available individually and can also we ordered with a variety of ball mount adapters. Many Ball Mount Adapters: Standard, multi-ball, raised, drop and pintle hook. Standard Ball Mount: Works best in most applications. Drop range is 1/2" to 3-1/2". (hitch ball sold separately). Combo Ball Mount: This adapter has both a 2" and a 2-5/16" hitch ball welded to a single adaptor. Drop range is 1/2" to 3-1/2". Raised Ball Mount: Used when tongue height is high or when receiver height is low. Drop range is +2" to -1". Hook Ball Mount: A common hook up used on construction trailers. Drop range is 2-1/2" to 5-1/2". Easy To Use Design: The air shocker and standard shocker are easy to use and install. Make towing easy and your ride comfortable. 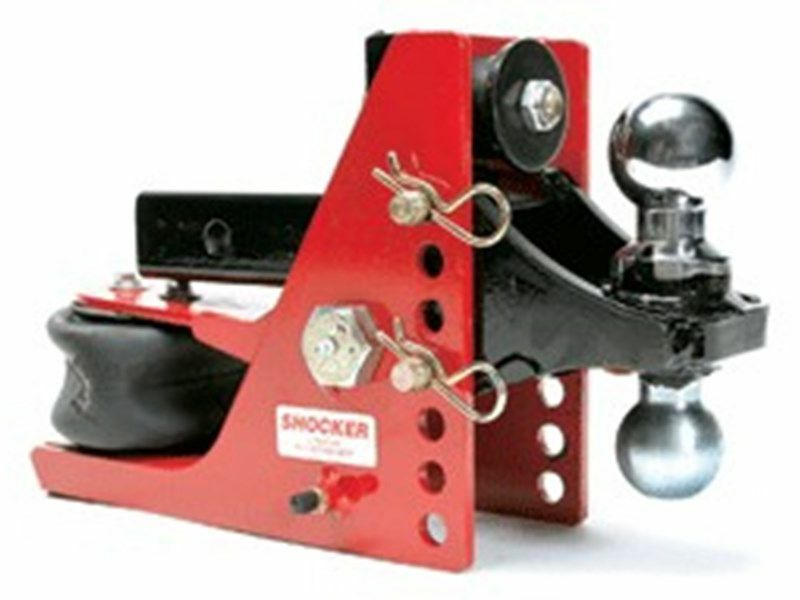 Air Suspension Shocker manufactured by Shocker Hitch. 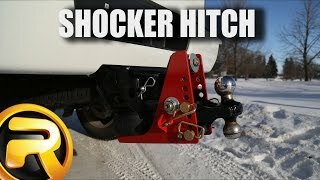 The Air Shocker Hitch receiver hitch air suspension ball mounts for heavy duty towing and trailer applications. Featuring the Shocker damping action. The shocker hitch air ride cushion makes towing simply and eliminates vibrations, constant bumping, jerking and so forth. The air hitch Shocker is a miniature air suspension unit mounted between your truck and trailer. The Air Shocker mounts by sliding into a two-inch receiver tube. The air bag sits under the receiver tube allowing a short distance of 10-inches between mounting pin and ball center. You will find the advantage of the Air Shocker is your ability to adjust air pressure for best ride and load control. Another benefit from our air ride Shocker hitch is it can be used as a tongue scale, 5lbs air pressure per 100lbs tongue weight. Provides comfort with a smoother ride! Travel a lot on concrete highways? No more jarring every time you cross a section divider. Your Shocker air hitch absorbs all the thump, thumps. Since the Shocker air hitch model works as tongue scale, you can remove the guesswork from load balancing ! Order one today and ride safer on your next trip. Save money by reducing trailer breakage! The Shocker air hitch model helps absorb the bumping and vibration experienced with a typical hard connection. This greatly reduces the chances of breaking welds and doing other long term damage to your equipment. Improve vehicle control and increase safety. Plus add life to your vehicle by reducing wear and tear on driveline. Usage: The Air Shocker may also be used as a handy tongue weight scale for determining proper loading of trailer. See chart below. Under normal circumstances tongue weight should be at least 10 percent of total towing weight. 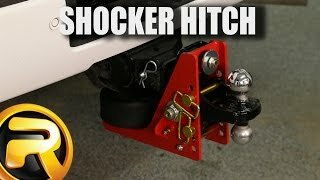 Note: It is highly recommended that the hitch ball be greased to reduce wear and improve shocker action. Note: If it takes more than 60 psi to compress top bushing this indicates you have more than 1200 lbs of tongue weight. This product offers an easy, at home installation. The installation and set up manual is clear cut and easy to read. For additional information, please see the installation manual below. You may also call us toll free at 1-866-309-1907 or 701-253-5906.